RUSH Home-Based Care is part of the projects run by our new partners RUSH Kenya who are based in Kakamega, Western Kenya. As of May 2018, we are supporting this work through International Needs Kenya. RUSH Kenya was founded and is managed by Lucy and Andrew Amukowa. Through the RUSH Home-based Care programme, voluntary trained carers visit vulnerable people in the community. Many of these people are elderly or disabled and unable to properly care for themselves. 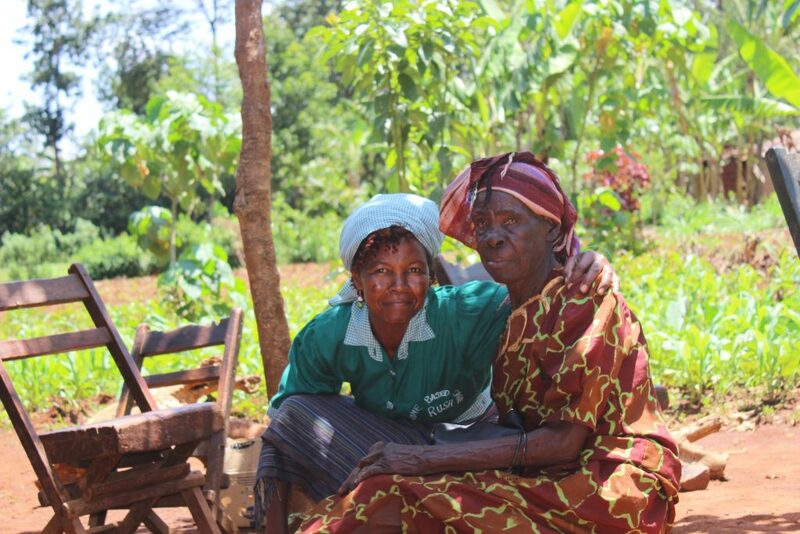 Carers such as Esther support them by performing many tasks such as assisting them to wash, collect water, change their beds and help keep their homes clean. The carers provide support for a number of vulnerable people in the area. Esther regularly visits vulnerable people in her community to provide them with care and support. Esther is a voluntary carer for the RUSH Home-based Care project. She regularly visits many vulnerable people around her community to provide them with support. She helps people clean their homes and change their bedding and collect water for them. She will also provide personal care, helping people bathe themselves and treat infections and other problems. As she works she encourages the families nearby to the vulnerable person to also get involved and look after their neighbour. 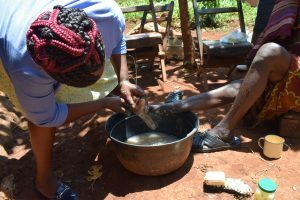 Here Lucy Amukowa is cleaning the feet of an elderly lady who recently had jiggers in her feet. We hope to support this work more with your help. We are very excited to announce our new partnership with RUSH Kenya, led by Andrew and Lucy Amukowa. RUSH Kenya provides vital support to poor and vulnerable families in Kakamega, Western Kenya. They run two schools and various community projects such as a women’s fellowship, feeding programme and adult literacy classes. We are glad to welcome them into the International Needs family as they start to work with International Needs Kenya and UK.